One of the less talked about benefits of using the FlashFood app is the way it can force you to flex your creative cooking muscles. Purchasing products near their sell-by date is a great exercise in thinking of new ways to incorporate an unusual food as a component of your recipes. Take yogurt for example - it’s an ingredient used in cuisines all over the world, yet in North America we often overlook its versatility and treat it as a simple mid-day snack or breakfast companion. Well the time has come to start recognizing the potential of this cool and creamy food and begin incorporating it into our baked goods and weeknight meals! Read on below for some simple ways you can begin using yogurt in your kitchen creations. Even though it has all the elements to ensure a moist and flavourful end product, whole, plain yogurt is a lesser known baking staple. Its fat provides creaminess, while its water content lends to a moist dough/batter, and the natural acidity adds a touch of tang and, more importantly, reacts with leavening agents to help with rising. An easy way to capitalize on these advantageous properties of yogurt is to add it to quick breads - a diverse family of baked goods that rise from baking powder or soda instead of yeast. Quick breads include items like banana bread, blueberry muffins and coffee cake (aka all the best stuff). For an easy entry into using yogurt in baking try this healthy Greek Yogurt Apple Oat Bread. Not only does the yogurt help create a dense and moist bread, it has the bonus of using only one bowl during prep! If you prefer a sweeter quick bread then go for this Lemon Blueberry Yogurt Bread - it also uses plain, Greek yogurt and produces a more Instagram worthy creation. An additional secret use of yogurt in baking is in cupcake frosting! This recipe uses a mix of cream cheese and Greek yogurt to make a less calorie-intensive frosting, without losing any of the texture. It’s a neat trick to have up your sleeve if you find yourself baking for any health-obsessed colleagues or friends. Featured in drinks like lassi and kefir, yogurt is no stranger to Middle Eastern and Indian cuisines. In fact, it often stars as the main ingredient in many meat marinades! The lactic acid and microbes found naturally in yogurt tenderize muscle, while the mild pH helps to prevent toughening of the protein. Besides the tenderizing functionality, yogurt also imparts a nice tangy flavour on meat, and pairs perfectly with Middle Eastern and North African spices. Yogurt marinades work best for overnight soaks, but can still be effective when left to sit for just a few hours. This type of marinade often works best with chicken or lamb, like in this Tunisian inspired overnight Leg of Lamb. For a quicker (aka weeknight) yogurt-marinated dish, try these Syrian influenced Chicken Kebabs with Aleppo Pepperor this Mediterranean style Garlic-Yogurt Marinade, perfect for chicken thighs. If you are a plant-based eater than have no fear - yogurt can still shine in your daily dinner prep. Make this whole yogurt based Chickpea Curry for a filling weeknight meal. If you prefer a simple boost of flavour merely add a generous swirl of yogurt into your vegetable-blended soup or add a dollop onto your bean-filled burritos. Anytime you need an ingredient to cool a spicy dish, or to add some creaminess, just think of yogurt! It’s no secret that yogurt on its own is a fixture in the snack world. However, that doesn’t mean you can’t liven up your snacking with other yogurt-focused alternatives. A trendy Chia Seed Pudding is a great example of using yogurt to create a healthy and customisable creation sure to get you points on social media (or at least in your household). Just be warned that it needs a least 2 hours in the fridge to set to the right consistency - too little time to chill and you will be left with a soupy mess. 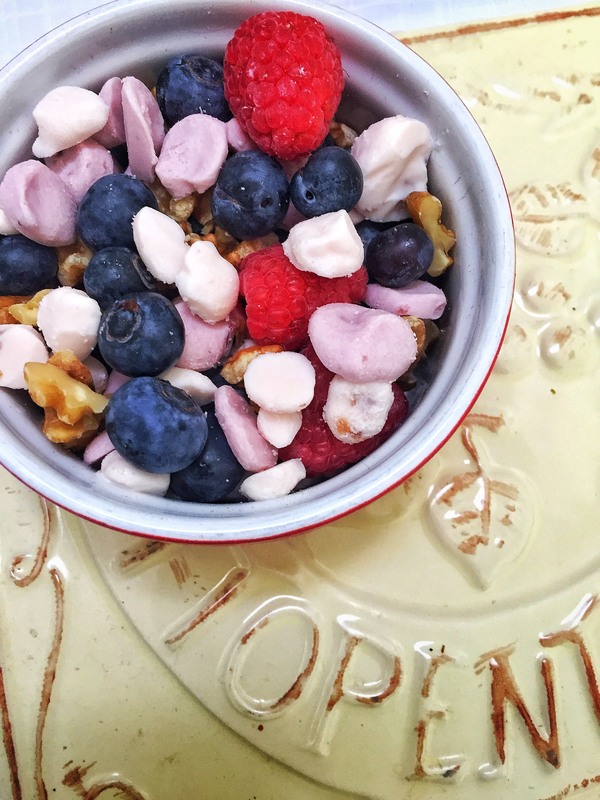 For a quicker snack that satisfies post-gym cravings try making Fro-Yo Dots and mixing them together with chilled berries and nuts for a cool new take on trail mix. This method is a great way to use up excess (or on sale) pre-flavoured yogurt and ensure you don’t throw away something delicious. Of course you can always travel back towards the Mediterranean and Middle East and utilise yogurt to make simple dips like Tzatziki, a cucumber and garlic blend that rivals hummus (in my opinion). Or if you want to try something a bit more unknown give labneh a go. Dress it up with some Olive Oil and Za’atar (a delicious spice mix) and you will never look at yogurt the same again.